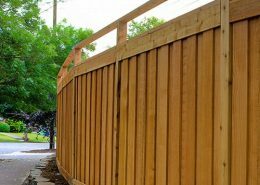 Continue reading to learn some simple maintenance steps you can take to ensure that your fence is kept in immaculate condition no matter what it encounters. There are many reasons to love a steel fence, such as the fact it will not burn or rot as a timber fence might if not built correctly, and termites will not attack it. One of the primary concerns with steel fencing is that the material can be susceptible to rust. You can reduce the chance of having a rusty fence by using quality products such as Colorbond® fencing or PermaSteel steel fencing as this is no longer an issue due to the protective coatings. These products are built to last and very durable. Made of galvanized steel, they can resist chipping, cracking, peeling, or rust formation. This anti-corrosion property is exactly what you need for your fencing, as it is both stylish and functional. Another common issue with residential fencing is the attack of algae on your property. Algae consist of moss, mould, or mildew, which can all be harmful to your fencing. If algae have already set in on your existing fencing, use soap and water or a vinegar mixture to remove it immediately to and avoid the spread. With a treated pine fence in place, algae will not have a chance to develop or spread. Treated pine fences are weather, decay, and termite resistant. With no moisture on your planks, you will have no algae or mould to worry about. Treated pine will last for decades and prevent the wood from deteriorating in both hot or cold temperatures. A common approach to keeping your residential fencing in tip-top shape is to inspect your fence regularly, especially after thunderstorms. Weather, such as rain, hail, and high winds, can cause moderate to severe damage to your fencing. Make sure you inspect it after a storm and take the necessary measures to repair it as needed. With treated timber or steel fencing in place, you will have no issues when a random storm develops. Permasteel, Colorbond® and timber fences are built to withstand Australia’s wildest weather conditions and are backed by a ten-year warranty. Another option to keep your fencing looking great is to paint or stain it. If you have timber fencing, applying a natural stain with a brush will help to seal the wood. Treated pine fences are already weather, termite and decay resistant as the treatment prevents the material from degrading under extreme hot and cold weather conditions for decades and provides extreme resistance against termites, fungi, and bores. With metal fencing, it is best to use an oil-based primer or a metal-specific paint to seal in the material. This will prevent deterioration and assists in rustproofing your fencing. 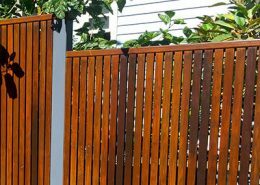 By choosing Colorbond® or PermaSteel fencing, you’ll have a variety of colours to choose from and no further treatment is required. There are really no issues to contend with when you choose this type of fencing, as it does not require any type of upkeep or maintenance. Permasteel and Colorbond® fencing is manufactured with galvanized steel so they are both strong and durable. Finally, an effective way to keep your residential fencing in immaculate condition is to have it power washed at least twice a year. Pressure washing your steel or wooden fence removes all the built-up grime, dirt, debris and foliage that can affect your fence through the seasons. By power washing your fencing, it will be looking brand new again in no time. How Can I Keep My New Steel Fencing in Good Condition? or you choose fencing materials such as treated pine or steel, which will not rust, need any sealing, staining, or painting, your fence will be both resilient as well as looking good for many years to come.